'Every quilt tells a story', but textile artist Bronwen Jones soon discovers that not all the stories are happy ones. As the new Quilter in Residence in the small mid-Wales town of Llannon, she seeks to discover the area's quilting heritage, but in the process she finds herself caught up in a modern mystery. Is there a link between the disappearance of a young girl two years ago and the hit-and-run victim found at the roadside? And whose bones have just been unearthed in a landslip on a remote hillside? According to DS Flint, the body has been buried for over seventy years. The victim died a violent death. Someone, Bronwen realises, believes they got away with murder. Until now. Then there is the beautifully stitched half-quilt she discovers on a local farm. What happened to the other half? Finding the missing piece of the quilt reveals a hidden past, secrets that have been long buried. Her quest to unravel the truth brings her into conflict with ruthless and vindictive nightclub owner, Lloyd. He makes it plain her interference is unwelcome. What is he hiding? Sad, lonely and unloved, Lloyd calls her. Over forty, overweight and with the new love in her life back in America with his ex-wife and daughter, Bronwen has to accept it is true. When ultimately she is at the mercy of Lloyd's vengeance, she fears there is no Sir Galahad to come to her rescue. But is there someone watching out for her? The antique quilt was exquisitely embroidered with flowers and leaves. A labour of love, Bronwen thought. Until she discovered a darker purpose to the quilt's design. A Patchwork of Poison introduces textile artist, Bronwen Jones, working on her art quilts for an upcoming exhibition near her south Shropshire home. Sixteen year old Cat asks Bron's help in uncovering the history of her heritage quilt, and the rumoured lost inheritance. 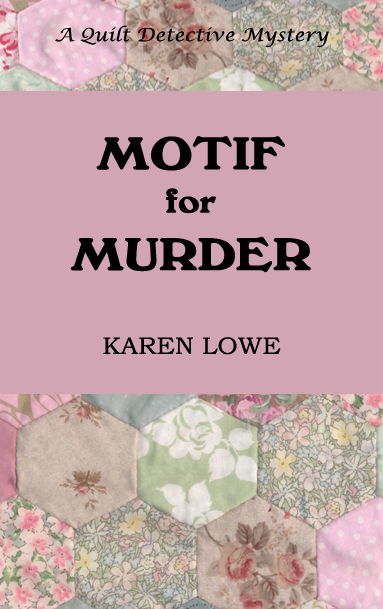 But when Cat disappears and a schoolfriend is found murdered, Bron discovers the thread that links past and present, and the deadly secret the quilt conceals. "I really enjoyed this book and was enthralled by the seamless ease with which the author worked the story of the past with that of the present." "Karen Lowe re-creates a past in which a young girl in a financially secure position tries to push the limits of acceptability to rid herself of an unwelcome new governess; she creates a present in which a young girl is in danger. Her writing is immediate and believable and we care about them both. I enjoyed this book very much and read it in 24 hours. " "This is a well-written cosy mystery which was a gripping read. It's full of twists and turns stereotypes on their head. There is also a crafting theme running through this which, as a crafter, I found inspiring." PAPERBACK £1.99 free postage UK only, from Beanpole Books. Please click the BUY NOW button to pay securely by Paypal. You do not need a Paypal account to do so. The story continues Fern Green's career as a garden designer, and her relationship with hunky Welsh detective, DI Ross Drummond. When the body of a newborn baby is discovered in the long-neglected garden of Plas Graig, Fern discovers that the secrets of the past still haunt the living. Now a girl has been found murdered in nearby woods, and the echoes of past wrongs can no longer be stifled. But Fern soon discovers that there are some in the village who would prefer the past remained buried. As she tries to find a link with an apparent suicide six years before, her quest to unearth the truth puts her own life in danger. "This is so well-written! The storyline begins on a rather quiet note and then slowly builds up to the discovery of the baby's bones in the garden which of course makes the reader want to read on and discover what exactly is going on "
"I loved everything about this excerpt - from the setting (the damp, rainy countryside, and let's not forget the potentially beautiful gardens), to the sense of loss woven throughout the excerpt, and then to the characters. There is almost a barely concealed anger to Owen, and if you enjoy mysteries that immediately sends up red flags. Fern seems almost meek by comparison, but then that is a very nice counterpoint to Owen's anger. And then there is the mystery of the baby found in the garden? ... There is a wonderful sense of familiarity here as well, I instantly felt like I could know the characters, which made me invest in them right away. Excellent"
"If you like your crime novels cosy with an unusual background then I would recommend this book and its predecessor, Death in the Physic Garden "
"More gorgeous gardening from the talented and capable Fern Green. I fell in love with her in the previous book (Death in the Physic Garden), and this time around that love deepened. An enjoyable read... I look forward to another installment"
PAPERBACK £1.99, free postage UK only, from Beanpole Books. Please click the BUY NOW button to pay securely by Paypal. You do not need a Paypal account to do so. The first in a series of Shropshire-based murder mysteries featuring garden designer Fern Green. When Fern escapes from London to start her new business in the South Shropshire hills, she believes she has found peace and safety at last - until she discovers the body of her first client, wealthy herbalist Joshua Hamble, dead in his physic garden. So begins a trail of murder and revenge as Fern unearths the Hambles' family secrets. Overshadowed by murder and suspicion, her relationship with hunky Welsh detective, DI Drummond, seems destined not to flourish, but even in such stony ground, a fragile affection begins to grow. Can it survive the searing heat of betrayal? As Drummond warns her, "gardening can be a dangerous business"
"Well written with a complex plot and some interesting characters "
"I enjoyed this so much that I immediately bought the next in the series "
This mystery features some beautiful description and heaps of gardening knowledge, as well as a gritty murder puzzle and a difficult, but promising relationship that begins to develop in this first book of what surely will be a series. For the discerning reader"
" Perfect for the Gardener"
"the atmosphere and location are brilliantly done"
"I never guessed the ending"
From Shropshire's rich folklore come stories about the giants, knights, ghosts and witches who populate the landscape, teamed with wonderful illustrations by Robin Lawrie. Read about Jenny Greenteeth, Nicky Nicky Nye, and the escapades of Shropshire's own Robin Hood, Wild Humphrey Kynaston. Meet Ippikin the Robber Knight, if you dare, and be enchanted by the story of Wild Edric and his Elf Bride. PAPERBACK on sale at Beanpole Books. £1.99 Free postage, UK only. Please click the BUY NOW button to pay securely with Paypal. guaranteed to win friends for this county"